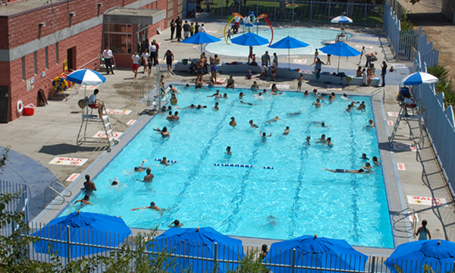 For decades, Downey Park Pool located near Dodger Stadium, has been the only local swimming pool. When the facility closed in 2005, Counsilman-Hunsaker was retained by the city to redesign the aquatic amenities and update the mechanical room. A decision was made by the city to replace the existing single pool with two new bodies of water: a lap pool and free-form recreation pool. As home of the new Los Angeles City Swim Team, the “Downey Ducks,” the location and placement of the new lap swimming pool took advantage of the naturally shaded seating area created by the trees along Broadway, providing parents a cool place to watch their children swim and play. The recreation pool provides an opportunity for young children to interact with water in a safe environment, while promoting water confidence. To acknowledge the pool facility’s proximity and relationship to the Los Angeles River, the large pool deck features “river” theme design patterns. This theme is further captured in the design of a new concrete serpentine bench and the wave fence that parallels the river. The new family-friendly pools will serve youth and adult swimming classes, as well as recreational swimming.